Phabrix RTE technology instantly highlights any SMPTE compliance issues, including eye under/overshoot. Phabrix will demonstrate its newest solutions, options and upgrades at NAB NY. The company will join its authorized distributor AVBB on Booth N751. On display will be Phabrix’s flagship Qx Rasterizer Series and portable Sx TAG, now with SMPTE 2110 (-10, -20, -30 and -40) with PTP and ST 2022-6 support. They offer an excellent solution for next-generation hybrid IP/SDI environments. The Qx Series now offers new stream and network analysis tools include a Packet Profile Generator (PPG), offering an advanced toolset for stress testing video networks, and Packet Interval Timing (PIT) analysis for rapid diagnosis of issues such as packet congestion. The Qx Series’ new SDI-STRESS option provides an advanced toolset for SDI interface stress testing which, together with its fast, automated 12G-SDI physical layer analysis employing RTE (Real-Time Eye) technology, provides a world-class solution to SMPTE compliance verification of 12G/6G/3G/HD-SDI interfaces in single, dual and quad link configurations with up to 12G payloads. 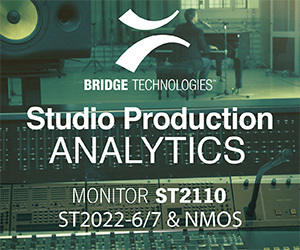 The toolset includes SDI jitter insertion (10Hz to 10MHz, 0.01UI to 16UI), eye amplitude adjustment (+/-10%), pre-emphasis, signal invert and mute features operating with either the video pattern generator with pathological overlay as source or a new PRBS Signal Generator (PRBS7, 9, 15, 23, 31), coupled to a new BERT Analyzer tool. 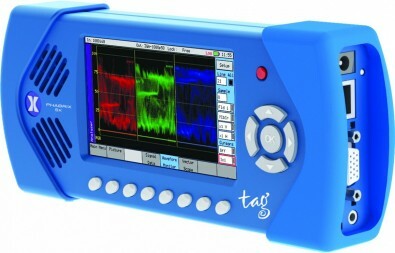 In addition, a new Pathological EQ/PLL condition detector with real time trigger over GPI out is provided. A popular Qx feature is its innovative, fully configurable user interface, allowing users to adapt the display for their preferred working practice. It can also be controlled remotely, offering analysis, monitoring and automated testing from any location. The instrument employs VNC technology to deliver up to 16 simultaneous scalable instrument windows remotely with network access to event logs, screenshots and user presets. Adding to its already powerful PQ HDR toolset, the Qx Series also now offers support for Hybrid Log-Gamma (HLG), S-Log3 and SR Live, enhancing the visualization and analysis of 4K/UHD and HD content. PHABRIX Sx TAG can support SMPTE 2110 (-10, -20, -30 and -40) with PTP and ST 2022-6. Also at NAB New York will be a brand new Audio/Video Delay option for PHABRIX’s Sx Series handheld instrument. The new option combines a programmable AV test signal generator with an automatic AV delay analyzer, providing the ability to track audio to video timing within a signal chain. Phabrix will also exhibit its T&M solutions at SMPTE 2018 in Los Angeles the following week.